Learn how to whip stitch with this free tutorial. This quick and easy sewing technique is a fantastic way to join granny squares or other pieces together. There are many different ways of joining afghan squares to create an afghan; of all the different methods available, whip stitch is my favorite. You'll need two or more items to be joined. For this demonstration, I'm using a couple of crocheted afghan squares; the same technique can be adapted to join many other types of items. Yarn – Depending on what you are trying to achieve, you can use either a contrasting yarn or a yarn that matches your project. For the purposes of this tutorial, I chose a yarn that happens to be both contrasting and matching. The yarn contrasts with the darkest stitches on the outer edges of the afghan squares, yet matches the lightest color in the design. If you are making a one-color afghan, it's nice to do the whipstitching in the same color as the rest of your afghan. If for some reason you want the whipstitching to stand out and contrast from the rest of the afghan, that's a perfectly acceptable alternative. If you're making a multicolored afghan, you'll have to decide which color you think will look the nicest for joining the squares together. 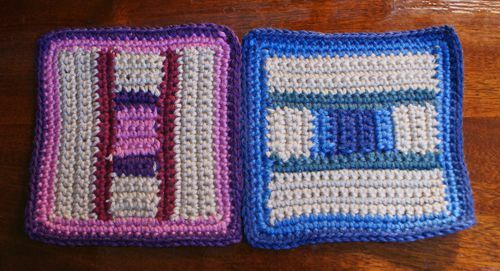 Here I have a couple of crocheted afghan squares. I am going to whip stitch them together. If you're going to whip stitch a couple of afghan squares together, the first thing you want to do is align your squares. There are different ways you could do this. Some people like to hold the squares back to back, with the wrong sides facing each other. I prefer to set the squares flat on a table, aligning them so that the sides to be joined are touching each other. I'm right-handed, and I like to sew from right to left. I can't think of any good reason why the squares couldn't be joined from left to right if you prefer to stitch in that direction - for example, a left-handed person might prefer to go from left to right. 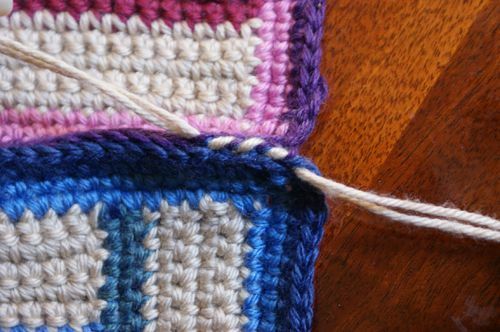 Either way, line up your squares so that you can stitch in the direction you want to go. I put one square on top of the other, with the spot to be seamed in the center. I've threaded my needle and I'm getting ready to start stitching, which you can see in the photo at left. I'm working through the back loop (the loop farthest away from me) on the lower square and the front loop (the loop closest to me) of the upper square. This is how I choose to stitch when I want to achieve a seam that is not overly bulky. If you want a heftier, stronger seam, you could choose to stitch through both loops on each square. Draw the yarn through the loops, making sure to pull the entire length all the way through. Leave a tail of yarn about six inches long hanging from the end. Later, when you are finished whip stitching the squares together, you'll want to weave this end into the back of the closest afghan square. This is a necessary step because you don't want your seam to unravel, and you also don't want want pieces of yarn hanging off of the afghan. Note that I am stitching with my yarn doubled, which actually creates two loose ends at each side. You don't have to double the yarn, but you can if you want to. If you double your yarn, you'll have a slightly sturdier seam, but you'll use double the yarn and you'll have more loose ends to weave in. If you stitch with a single length of yarn, the seam will be sleeker and you'll have fewer loose ends to weave in. Insert the tapestry needle into the next unstitched set of loops. Draw the yarn through, pulling it all the way through so that it is taut, but also making sure that some flexibility remains; you don't want it to be either too tight or too loose. Your stitch should look like this. Repeat the same steps again, inserting your needle into the next set of unworked loops and then drawing the yarn through. You can begin to see how the whip stitch will look. Here's a close-up picture of my finished seam. Here's Another Picture Showing the Joined Afghan Squares. This is how the afghan squares look before I've woven in the ends. If, for some reason, you're only joining two squares, you could weave the ends in at this point. If you're making an afghan, you'll be joining more squares; in that case, you can continue using the same yarn to keep stitching the next set of squares that you want to add. Whip stitch is also useful for joining other types of projects; see my box-shaped projects for a few other project examples.